Naked pizza rocked my world for dinner. 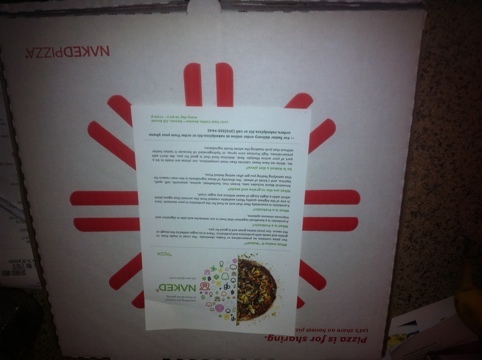 It started out with a super easy order online where you can customize your pizza or choose from the normal combinations. 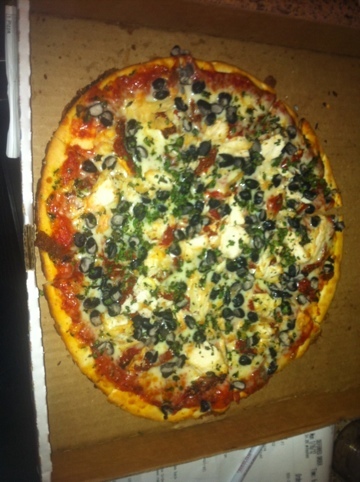 A gluten free 12″ crust was the start… Topped with some pizza sauce, light cheese, chicken, black beans, roasted tomatoes, and cilantro. While I must admit the black beans were a little weird to have on my pizza, they added the extra protein I need for my long 5 mile morning run. It was weird to have a pizza box actually, I have not bought pizza in ages and the last time I got “gluten free” pizza was from West Crust in Lubbock I was sick a a dog almost immediately and the next day. (this does not include the homemade pizza made by Corey, which was delicious and did not make me sick)!! Overall a great dinner and something I suggest you try as there are a lot of toppings to choose from! Enjoy your gluten free pie! Posted in Gluten Free, Main Course and tagged gluten-free. Bookmark the permalink.